Make your teacher’s farewell party great and wish him/her by these best Farewell Quotes For Teacher and Goodbye Messages to bid a memorable farewell. Really, teachers play a vital role to educate students and build up their career which could never be ignored. A good teacher try so hard, give time and effort to infuse all better things and good manners in a learner. So, never fail to care properly your teacher every moment even on his/her farewell. Send a heartfelt goodbye note, write a thoughtful message on a card or shower him/her by the best farewell wishes for teacher. Don’t miss the chance to show your deep respect and admiration to your teacher for everything he/she do to make your today’s position. Take ideas from this post to make your wishes unique and bid farewell your favorite teacher with smile, gratitude, respect and luck. Learning under this atmosphere will never be the same without a teacher like you. I hope that your new place is full of fun and happiness as usual. Farewell and thank you for being my inspiration! Never stop dreaming, and never give up. Now that I think of it, who am I talking to? I know that will never happen with you, so I’ll just say good luck. Technology has made it easier for students to learn with devices new, but nothing can come close to the experience of being taught by an inspirational teacher like you. Thank you. Sir/mam, we are sad to hear about your leaving. But on the brighter side; we know that there are more students who needs your comfort, words and teachings. Let us take this opportunity to thank you mam/sir because you have successfully completed your mission to us. Good bye! You affect so many people by the meaningful work you are doing, so when we wish you luck we are actually wishing many people an improved life. Thank you for working hard and making a difference, and best wishes to you and all those lives you touch. Ordinary teachers teach their students to succeed. Great teachers teach their students to convert their failures into success. I would like to give you a salute for being the great teacher, farewell. I don’t want to say lengthy words but I simply want to say that there was no one who can stand Against You and can say he is best. I will miss you sir so much. Astronauts, physicists, programmers, musicians, technologists, doctors, engineers, lawyers and all the other professions that make the world go around have one thing in common – a good teacher who gave light to their dreams. Farewell, to one such teacher. No one can fully know what the future holds, but I am confident that you will be successful and that I’ll miss you. Best of luck to you! Right now I am doing exactly what you have always taught me to do when someone does something nice for you – say thank you. Thank you for making me what I am. You will be missed, goodbye! 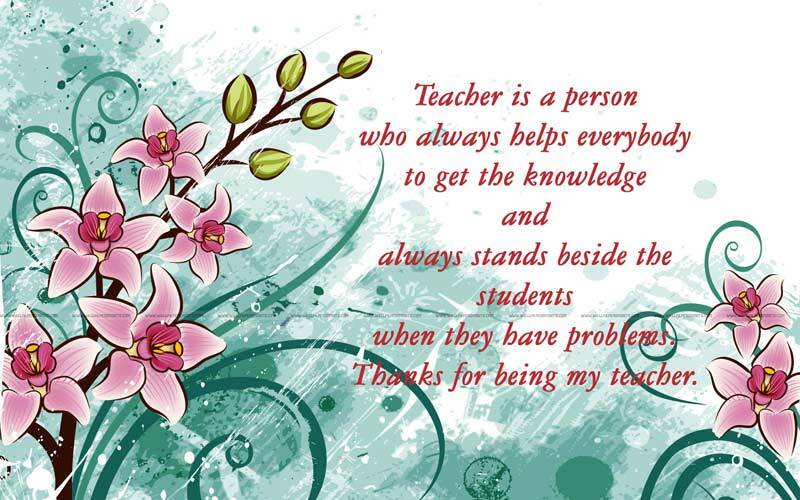 There’s no one quite like a special teacher, and no teacher quite as special as you. Thank you for everything, you will remain in our shining future, goodbye. You corrected my mistakes; you encouraged me with your words full of hope and support. I wish you all the best mam/sir! I learnt a lot from you! You are indeed an excellent teacher. I will really miss you. 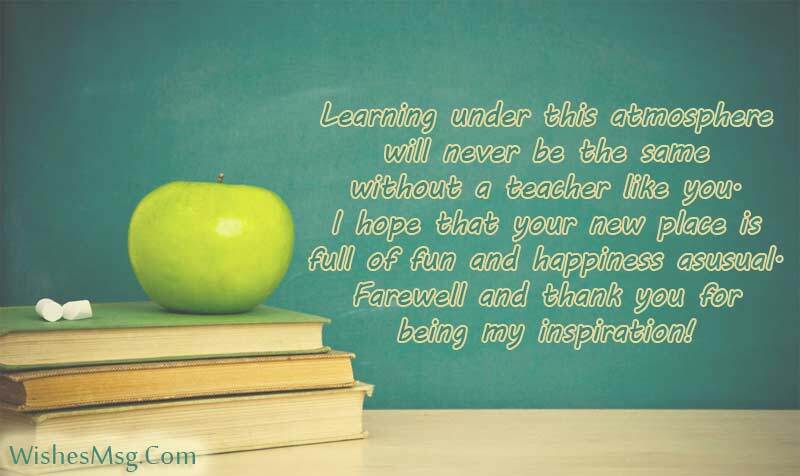 Teachers come and go but their memories are forever the lessons that they teach are forgotten never, Teachers keep changing every now and then but great ones are remembered time and again, Farewell. Nothing can come close to the inspirational presence of a teacher like you in a student’s journey. You have no idea how important a role you play in shaping for a student, a brilliant destiny. Thank you. I wish you nothing but peace, love and happiness. Hope you have all that wonderful things life has to offer in your new place. I’m seriously missing you here. Goodbye and I hope you will visit us when you have the time to do so. Good bye mam/sir! It’s so sad that you need to leave us, but though you need to go; your inspiring words and thoughts will always stay with us. Thank you mam/sir for your passion in teaching us what we need to know. We love you mam/sir! We’ll surely miss you. Thank you for the motivation, knowledge and insight that you have given to all of us. Thank You for being there for us all the time. And we thank you for the time and effort you have spent on us. Goodbye and we hope to see you again! I wish that you have many, many more days to spend with us. You are a special person to all of us, we love you and we will greatly miss your words of wisdom and encouragement. Goodbye! Thank you mam/sir for everything! Good bye and your teachings will always remain with us. You have been a very good teacher to us! God bless you more sir/mam! Please always remember that we’ll miss you a lot for that all that you’ve done and all that you’ve taught, don’t ever forget that you will always be embossed in our hearts and our memory, Farewell. Dear teacher… after my mom and dad, you are the second parent figure in my life. Thanks for all the advice that pulled me out of my teenage strife. What a teacher writes on the blackboard of life can never be erased. Like your teaching your memories also never be erased from our heart, goodbye. Words cannot express how painful it was when we heard of your retirement. You have been an inspiration to all of us in the department, and a mentor that we always look up to. We pray God gives you the strength and wisdom to continue the good work you are known for. Goodbye my mentor! The loving ways of teachers like you is the difference between teaching and educating. Thanks for teaching us, educating us and empowering us. I want to say many things to you but I can’t say those in front of you. But know I want to say that in one sentence. You were the best. Goodbye. The way you teach, it simply touches our lives. You are not our parents but you act like we are your own children. You are not our lawyer but you defend us when we need comfort. Teacher, we feel sad when we heard you need to go. We promise to be good always and we will always apply your teachings in our everyday life. We will surely miss you mam/sir! Classrooms are now going to have the dullest of hues. The school is now going to feel, boring and blue. Most importantly, learning will never be the same without a teacher like you. Goodbye. Thank you for the knowledge and skill you have given me and continue to give each day. I wish you long life in this country you have helped to groom young leaders like me. The future of mankind lies not in the hands of new technological inventions and scientific breakthroughs. It lies in the hands of ambitious teachers like you… because that’s where it all starts from. Thank you. Finding such a strong purpose and dream in your life the way you have serves to inspire those around you. In some ways you have already been a success even in your pursuit of greatness. Goodbye and good luck on your inspiring future. Schools, colleges and universities don’t achieve acclaim because of their historical buildings, heavy funding or celebrity alumni. They become great because they have outstanding faculty like you. Thank you my teacher. 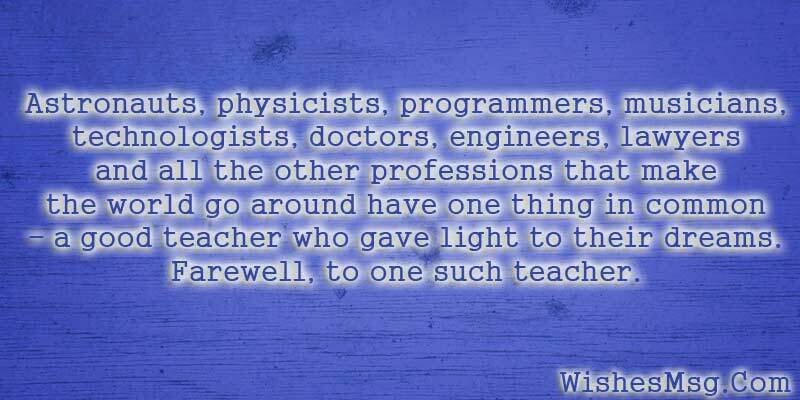 Get some ideas from these farewell quotes for teacher to write a perfect farewell message to bid a fantastic farewell to your honorable teacher, hope these quotes and sample messages will help you to write your own farewell wishes for teacher.